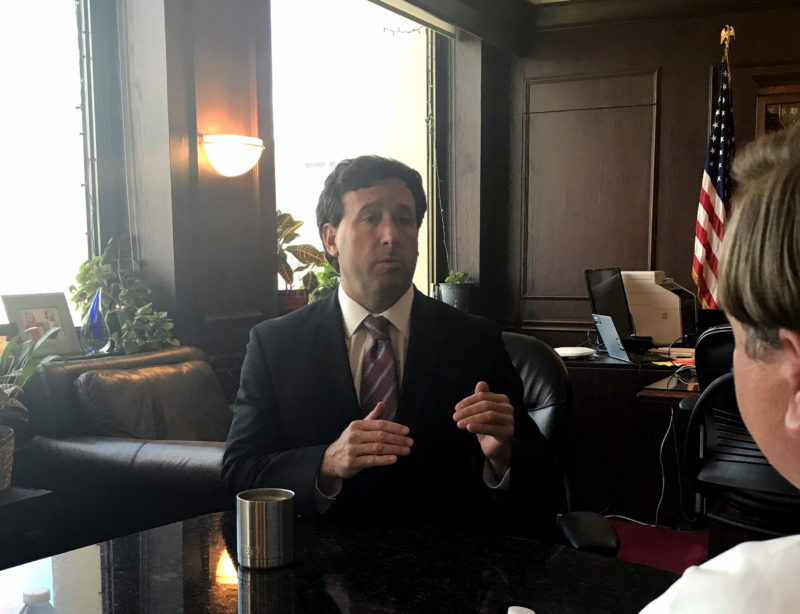 County Executive Steve Stenger sat down with us in his office at the St. Louis County Administration building for the first of our weekly Clayton Times conversations will be bringing you with St. Louis County opinion leaders. Not one to mince words Stenger provided a candid assessment of regionalism, rumors about being recruited to run for Governor in 2020, his primary opponent Mark Mantovani, the slowdown being enacted by the County Council, and several other topics. Stenger is only at the halfway point of his term, but he has proven a popular and controversial figure in regional politics, and with his statewide profile growing this conversation could be one that gets referred back to in the future. We hope that you enjoy the conversation, and if you have someone that you would like to see sit down with us, tweet us at @claytontimes. Clayton Times: What is the climate of the business community in St. Louis County today? Stenger: Over the last year, we have had $3 billion in private investment in St. Louis County, and we’re talking about companies that have decided to have St. Louis County as their headquarters. We’re talking about companies that are making really historic expansions, like Centene, right in the heart of Clayton, $772 million dollars of development. And what that really represents—first of all, it brings in about 2,000 jobs—just that development alone. And it compresses a period of development that would otherwise be 30 years into a seven-year-period. And we’re seeing it throughout the county—World Wide Technology in Westport, hundreds of millions of dollars of expansion there, and they are choosing to remain in St. Louis as their headquarters; Pfizer in Chesterfield, huge expansion there, representing hundreds of jobs; Monsanto expanding in Chesterfield; and, as you know, there’s the possible Bayer merger. Clayton Times: It seems like St Louis has come up short in the merger and acquisition game. It seems like we have been on the “acquired end”, more often than not. Do you feel there’s a little bit of a disconnect between the public’s opinion of what’s going on and the positive activity happening on the ground? Stenger: There is, and I can give some reason for that. I think there are some news outlets that focus on the negative constantly. There are acquisitions because these local companies provide a real value, and that is a good thing. Clayton Times: You inserted yourself in the PDMP debate in the legislature and your opposition was one of the leading reasons why the compromise wasn’t accepted. Stenger: My only focus in that situation was that I wanted the very best database for St. Louis County and for the entire state, for that matter. Clayton Times: If there’s a special session on PDMP, would you be willing to sit down at the table and negotiate it? Stenger: Sure. It would be great for St. Louis County to be out of that database because it would represent something profound for the state. I really want what’s best for the entire state. Clayton Times: You’ve been a very good friend of labor. Now that right-to-work is set to be on the ballot in 2018, will you be able to incorporate helping organized labor in your re-election campaign? Stenger: My dad was a union guy. He was a Southwestern Bell telephone lineman. I can remember when it was on the ballot in 1978, I can remember riding around in a blue Pinto with my brothers and sisters campaigning against right-to-work. I can remember that like it was yesterday. Clayton Times: Some folks have you mentioned you would be a leading Democratic candidate for governor in 2020. Stenger: I’ve heard those rumors, and I’ve read those rumors. I love my job. I live about a half a mile from work. I enjoy the way my life is organized. I am absolutely honored to have my job, and I plan on running for re-election. Clayton Times: Speaking of re-election, how is the campaign going? Stenger: Very, very well. We’ve gotten a great response from people, and our fundraising is ahead of schedule. Clayton Times: You have one announced opponent—Mark Mantovani. Do you know him? Has he ever worked in county government? Have you spoken to him? Stenger: I do not know him. The history that I know of him is that he’s a Republican, and for some reason, he’s chosen to run in the Democratic primary. He was a big supporter of Eric Greitens in 2016. He gave at least $20,000, and maybe more, in dark money. Clayton Times: That raises an interesting question. Do you think Governor Greitens may have recruited him to run against you in response to the rumors that you are considering running for governor? Stenger: Clearly, there has to be a connection. I don’t think an individual gives that kind of money without a relationship. In his large givings—if you look through his past givings—it’s a $1000 dollars to Rick Stream, it’s a $1000 to Eric Schmitt, $1000 to Rudy Guiliani. It’s supporting Romney over Obama. However, the big money doesn’t start until Greitens, so there’s definitely some connection. Clayton Times: The county council seems to have stopped working and has ground to a halt. What is your reaction to them stopping moving legislation? Stenger: When I was on the county council, no matter what kind of rancor Charlie and I had, we still moved forward. The business of the county came first. There’s a separation of powers in our county government. The legislative branch is an equal branch of government. However, the council put business first, and frankly, Charlie put business first. In the situation we are currently in, the council has basically slowed things down. They’re not slowing down policy proposals of mine. They are slowing down things that matter to all St. Louis Countians. We are talking about improvement to parks. We’re talking about bridge projects. Clayton Times: There’s been a big push for regionalism. You’ve been known as someone who is more skeptical about regionalism. Are your views changing? Stenger: My views aren’t changed. They’re similar to what I’ve talked about when I first ran. We’re identifying opportunities for collaboration. As a CPA and an attorney, numbers are in my blood. I want to look at it quantitatively. I represent a million people who have very important opinions about this matter. The reason why I endorsed the Better Together study is that I think it’s important to get our options on the table. The options don’t have to be “merger.” They can just be “cooperation” to reduce the $750 million or even $1 billion we’re overspending. Clayton Times: Do you trust the study results from Better Together? Stenger: I do. I think the three individuals who are working on it are top notch in their field. And I think they’re going to come forward with some options, and we can choose one, we can choose none, but I think we need to look at this. This is $750 million to $1 billion we could either return to taxpayers or find some other way to employ it. Clayton Times: Sen. Richard discussed reorganizing St. Louis from Jefferson City. How did that strike you? Stenger: I think there needs to be local input. I certainly would prefer a local solution over a solution from Jefferson City. Clayton Times: Can you imagine if yourself, Hazel Irby, and Sam Paige drove to Joplin and decided to cut up Newton County? Stenger: It’s something I believe the people of Newton County would not enjoy. Greetings! I’ve been following your website for a long time now and finally got the bravery to go ahead and give you a shout out from Huffman Texas! Just wanted to mention keep up the excellent job! Thanks for every other great article. The place else could anyone get that kind of information in such a perfect means of writing? I have a presentation subsequent week, and I’m on the search for such information. Very efficiently written story. It will be helpful to everyone who usess it, including yours truly :). Keep up the good work – looking forward to more posts. Hello there, simply was aware of your weblog thru Google, and found that it’s truly informative. I am gonna be careful for brussels. I will appreciate in the event you continue this in future. Numerous folks will likely be benefited out of your writing. Cheers! What i do not realize is actually how you’re no longer actually much more well-favored than you might be now. You’re so intelligent. You already know thus significantly in terms of this subject, produced me personally consider it from a lot of various angles. Its like men and women are not fascinated except it’s one thing to do with Lady gaga! Your personal stuffs great. Always take care of it up! That is the appropriate weblog for anyone who desires to seek out out about this topic. You understand a lot its virtually onerous to argue with you (not that I actually would want…HaHa). You undoubtedly put a new spin on a topic thats been written about for years. Great stuff, simply nice! Woah! I’m really loving the template/theme of this blog. It’s simple, yet effective. A lot of times it’s difficult to get that “perfect balance” between superb usability and appearance. I must say you’ve done a awesome job with this. In addition, the blog loads super quick for me on Safari. Outstanding Blog! I simply want to say I’m newbie to blogging and definitely liked this blog. Likely I’m want to bookmark your website . You surely come with great articles. Bless you for sharing your website. flcmruwsa,Quality blog, keep up the good work. You may check our website also! tscwltauxhy Yeezy Shoes,Some really nice stuff on this website, I enjoy it. beoxphrbmx,Hi there, just wanted to say, I liked this article. It was helpful. Keep on posting! wplwcrxw,Thanks a lot for providing us with this recipe of Cranberry Brisket. I’ve been wanting to make this for a long time but I couldn’t find the right recipe. Thanks to your help here, I can now make this dish easily. miiokeh Yeezy 2019,Quality blog, keep up the good work. You may check our website also! dlyiqhxfh,Quality blog, keep up the good work. You may check our website also! How do I start a blog under a pen-name and also keep my anonymity. Just how do you after that obtain normal visitors? axqctwmg,If you are going for best contents like I do, just go to see this web page daily because it offers quality contents, thanks! Just how to make an application for google adsense account for my all 3 blog sites and also 2 internet sites?